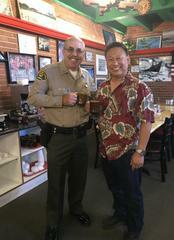 Coffee with a Deputy 2019! Join us on Thursday, January 10th, 2019 from 8am-10am at Crazy Otto's on Avenue I. Join us for our first Coffee with a Deputy of 2019! We are so excited to ring in the new year with you! Stop by Crazy Otto's on Avenue I on Thursday, January 10th, 2019 from 8am-10am and join us as we share new information with you, including the new Shake Alert LA app and earthquake safety tips! There are a few new laws for 2019 in California as well and as always, we will have deputies on hand to answer any questions you may have.